This is a NGO (Non-Governmental Organization) that was created to improve the cleanliness of the beautiful desert oasis of Huacachina, Peru. As with many places in South America, trash is a major problem! With the support of local businesses, local people, and travelers, we have volunteers lead and participate in daily trash pick-ups. We have also developed an educational program in local primary schools in Tierra Prometida, a nearby community. 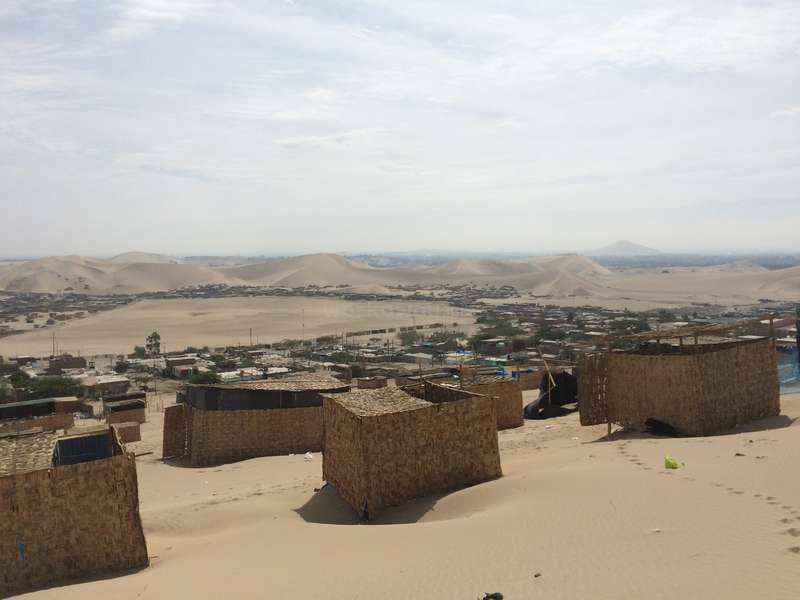 In the short time our project has been in Huacachina, there have been major changes in the environment and we hope to carry this project on long-term! 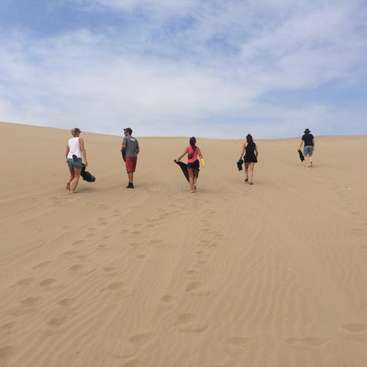 Travelers staying in Huacachina get to experience the beautiful oasis of South America and it's many plants and animals. Improve your Spanish skills with locals and experience the best of Peruvian cuisine. Many people working in Huacachina live in nearby Tierra Prometida, home to people from all over Peru. 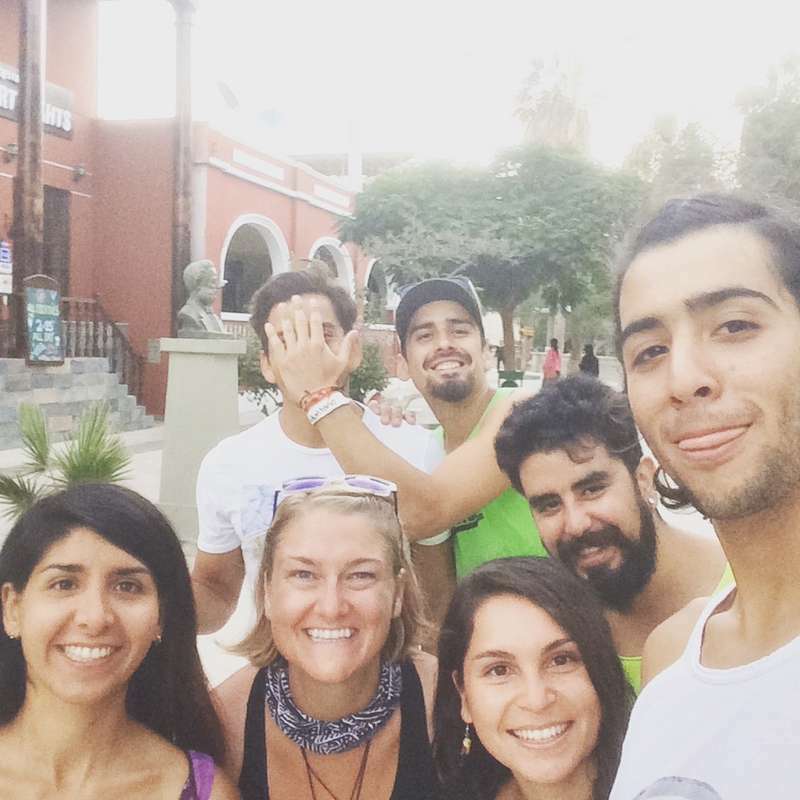 There is a real sense of community in Huacachina, so becoming part of this family is a wonderful benefit. Huacachina is also located near to Paracas and Nazca, where many historical sites can be visited. There are opportunities to learn new sports as well, including sandboarding, paragliding, and slacklining. We are looking for 2 + volunteers to stay with us at a time for 1-2 weeks (or longer if it works out!) 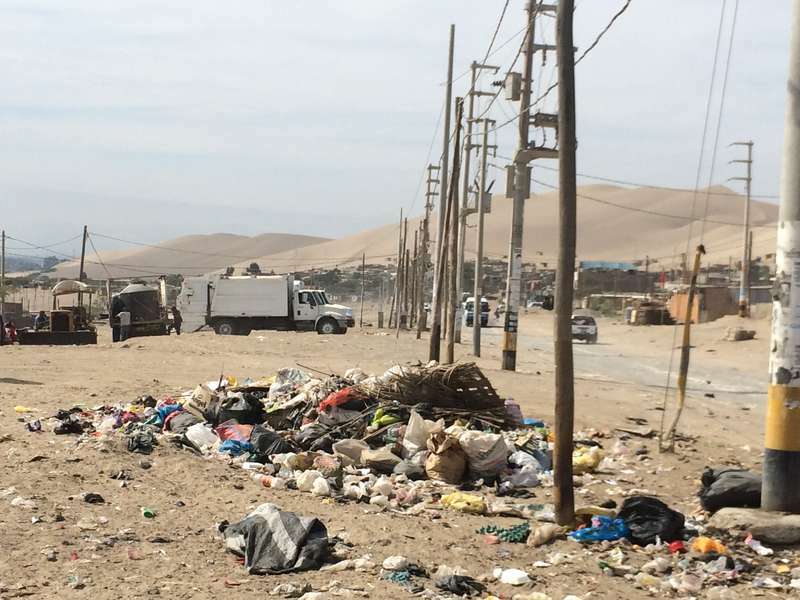 to help with organizing daily trash pickups both around Huacachina and in the surrounding desert reserve. This can be hard, and hot work in a sometimes challenging environment, so please be sure you are healthy enough to participate. Duties would include organizing daily clean ups (ensuring there are enough supplies, documenting participant info and daily kgs collected, and ensuring participant safety), recruiting people to volunteer through social media accounts and in person, and generally keeping the energy positive and fun. Daily recruitment includes going from restaurant to restaurant talking to travelers about the program and inviting them to participate (but not pressuring anyone!) along with inviting them to like our FB page. 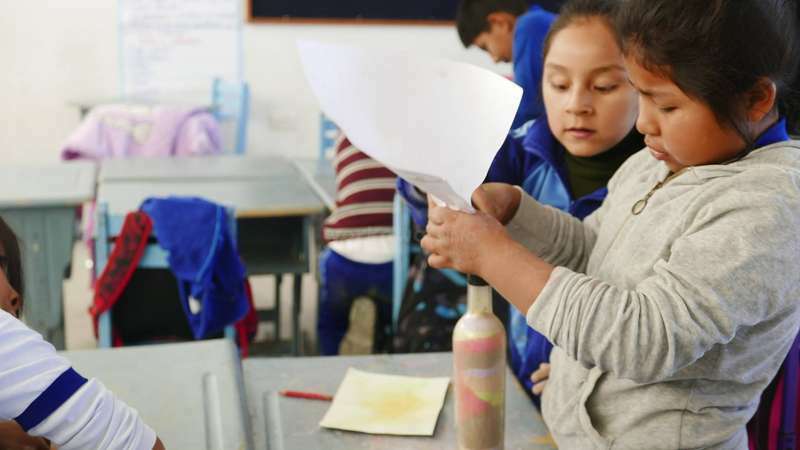 We also have an ecological program at local schools and our volunteer could assist with teaching the materials, hanging out with the kids, and seeing another part of Peruvian life. There is also potential to create new projects as needs change. Ideally we would have someone with some basic Spanish and English skills, who is organized, positive, friendly, outgoing and a people person, who is excited about helping clean up the environment. We need people who are self-motivated and enthusiastic who can work alone or in pairs to recruit. English and Spanish are both important as many travelers are comfortable speaking one or the other. There is a shared volunteer room with private bathroom for accommodation. Included is free buffet breakfast, access to the pool, and access to additional showers/ bathrooms as needed. There are very nice kitchen facilities with refrigerator and stove that can be used for preparing the rest of your meals and Ica has markets to purchase local foods. On your time off, there are plenty of options to relax. 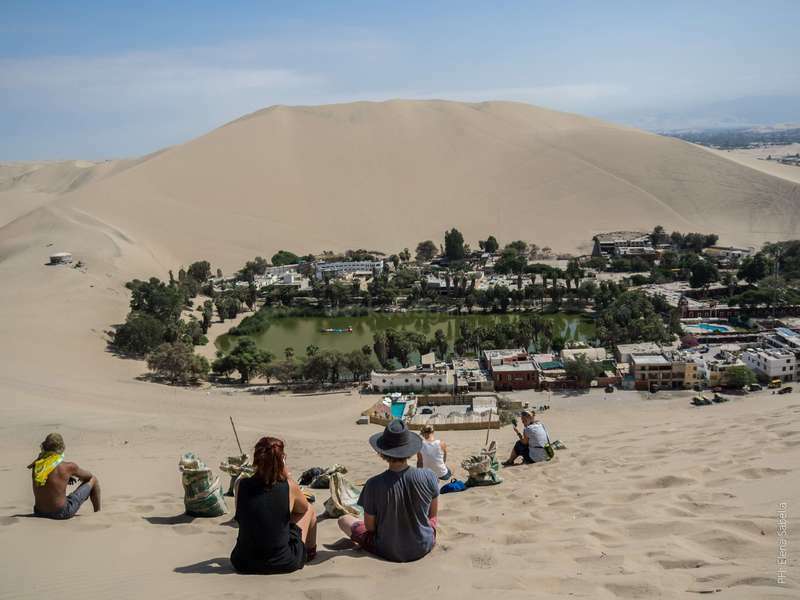 The hostels have Netflix and couches to chill, there are great restaurants and bars, and even a couple of night clubs in Huacachina, or you can go into Ica to the movie theaters to watch movies in Spanish. Ica also has El Quinde mall with access to shopping, a supermarket called Metro, Starbucks, and a food court. There is a small, but good museum called the Ica Regional Museum that has artifacts from the Paracas and Nazca cultures. Taxis are easy to catch in and out of Huacachina and Ica has a bus terminal. 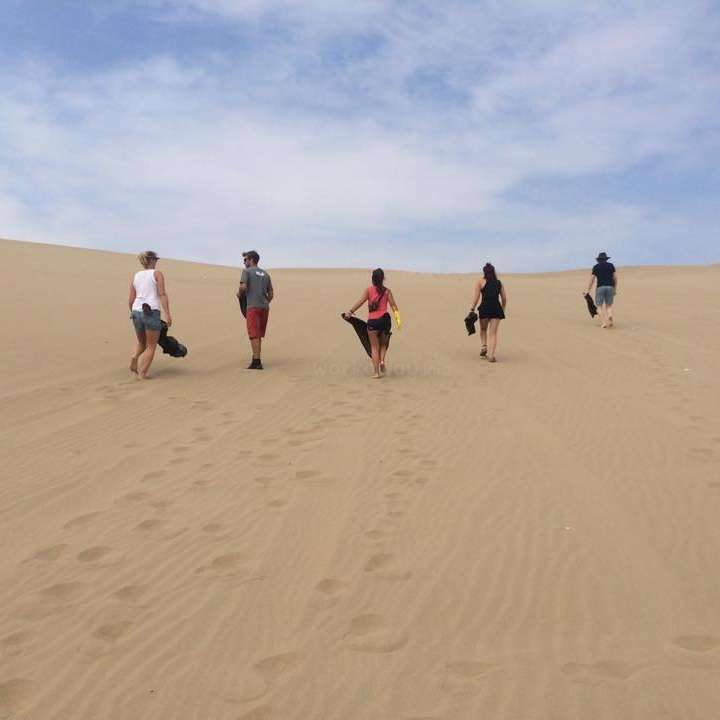 For adventure seekers, there are plenty of opportunities to explore what the desert has to offer from paragliding, sandboarding, slacklining, buggy rides, quad rides, desert camping, and day trips to the beach. If coming to Peru for the first time, it is a good idea to ask for 6 months on your tourist visa as this saves a trip in and out of Peru! Our time in Huacachina was awesome! First of all the place is very beautiful! It's a mistical place between the dunes and we really enjoyed beeing there. It was our first Workaway experience and it was totally positive! It was just about 3 hours of work a day, two in the morning and one in the evening. The staff and the responsible guy, Agusto,… read more were very kind and fiendly. additionally the accomodation was fine, just a bit hot due to the climate but clean and it has a pool! Further the breakfast was incredible! A really nice place to stay. I really recommend it! El entorno es íncredible : desierto, piscina, oasis sin hablar del desayuno... Cuando llegamos hubo un cambio de alojamiento y pensamos que el actual no es muy adecuado a las temperaturas, mosquitos, higiene (lugar completamente cerrado). Se hablo de poder hacer una ventana para el futuro. Colaboramos en la mañana y en la tarde, teniendo tareas… read more diversas : rellenar botellas con desechos, regar la zona de arboles y la principal : recoger la basura en el desierto. 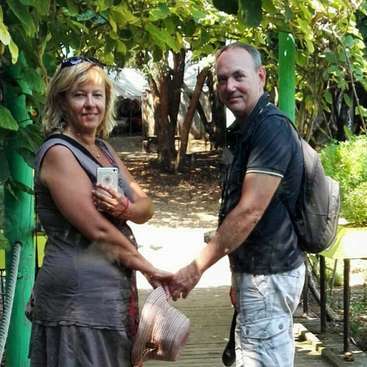 Augusto nos indicaba la zona del día y íbamos entre los voluntarios y se pueden sumar gente local o turistas. Es bastante relax. No duden de preguntar sobre el funcionamiento de la ONG y toman en cuenta que el nivel de vida es muy caro en Huacachina por ser una zona exclusivamente turística, pueden comprar en Ica y cocinar en el proyecto. Augusto and everyone working there were great. We generally worked for about 3 hours a day -- 2 in the morning, one in the evening, and were rewarded with a breakfast buffet and then a snack in the afternoon. Some days we might work a little longer, to finish what we were doing, if we felt the need. We didn't feel taken advantage of, and didn't… read more desire to take advantage of the project. This project is more than fair. Some days, we would invite other tourists/locals to help, and if they helped, they could join us for the afternoon snack -- a delightful experience, getting to know new people. 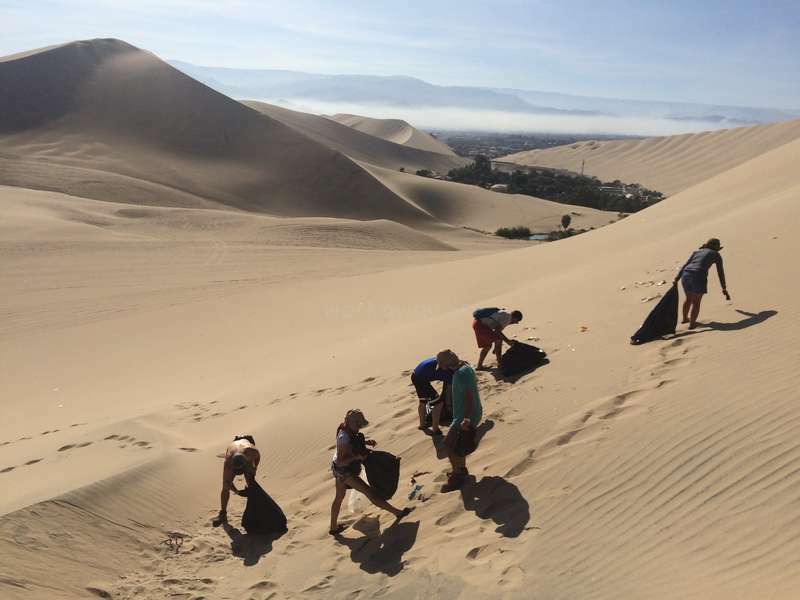 Work included picking trash (and many plastic bottles) from the sand dunes, picking trash from the main street of Huacachina, stuffing empty plastic bottles with trash so they can be used to build other things, digging holes, and planting baby trees. I would recommend joining this project for a week or two, just as recommended above. Augusto y todos los empleados con EcoDunas son fantástico. En general, trabajamos para 3 horas cada día, 2 en la mañana, y 1 en la tarde. Disfrutamos desayuno y un bocadillo después de trabajamos. Este proyecto es mas que justo. Algunos días, encontramos otras personas ayudar, y después comieron el bocadillo con nosotros, una experiencia encantadora, comiendo juntos y conociendo gente nueva. Nuestro trabajo incluye recoger basura de las dunas de arena y de la calle principal, llenado de botellas con basura para usar mas tarde, y plantado arboles. Recomiendo este proyecto para 1 o 2 semanas, como dice arriba. La verdad que es un placer trabajar con personas como Julie porque no solo dejan su grano de arena sino… read more también mucha esperanza por lo que hacemos!! We only worked here for more than a week, but have a great experience. It was great to do something to make desert and oasis better. 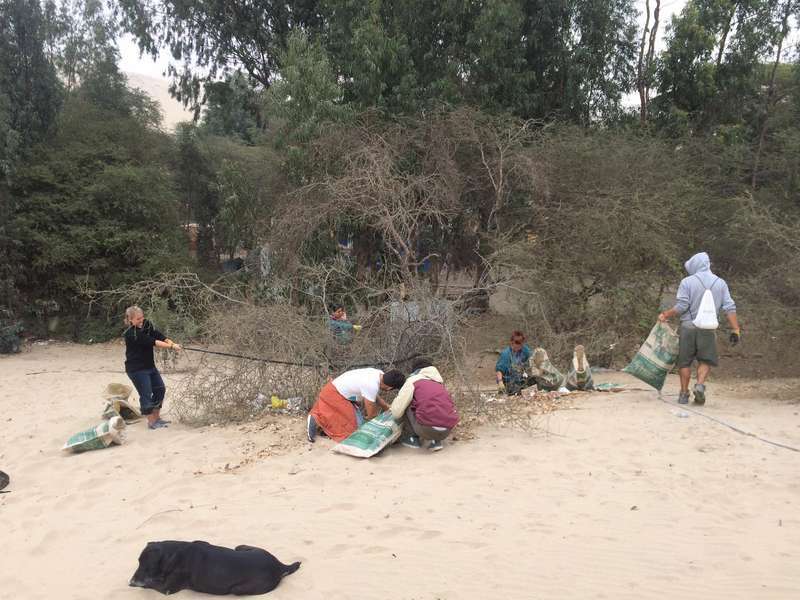 We plant baby trees in the oasis, pick up rubbish on the desert road in the morning, water the trees every morning and evening, and make wooden signs for each trees. Everyone were very friendly here. We like here so much and hope that those baby trees will grow up well. This gave me a lot! I spent a little bit more than one week in this little slice of paradise and I enjoyed every moment. The work is fun and it’s really nice to do something to improve this amazing place. Trash is a real probem but it is nice can help with it. Food is one of the best things. You have a lot of free time to walk in the dunes, go to… read more the swimmig pool or to do the activity you prefer. However the best thing of my days were the people, everyone in the hostel is friendly and with good vibe, you’re going to feel like in a family after one day. Those kind of projects are so important which is why I was happy to support them wherever I could. I appeciate Augusto's motivation and faith in a better future. Together with another volunteer I helped to clean the dunes - early in the morning before the sun got too hot and later in the afternoon. Indeed it was not always easy but nevertheless… read more you feel good afterwords. During our cleaning session we talked to some people who saw us and explained our intention to them. It's not about cleaning the whole place but more about setting en example and spreading our message. Moreover, I created some posters and hope that people will be more respectful in the future. Our accomandation and included breakfast as well as lunch (which you could chose from a restaurant menu) were really good. I can recommend this project and wish them all the best! Volunteering in Huacachina was amazing and I recomend it to everybody who has at least some feeling for environment. When you see the most beatiful sunset ever, it's great feeling, that it is so nice also because of your work. But the stay was great mostly because of the people around. Augusto gives still so much energy to this project (everyday… read more work for three years), which motivates everybody, who wants to help. I rented there also paraglide, by which I met other guys, which participate on this project. I had many great talks with all of them as well as with other volunteers. The work is not hard, but you should know, why you are doing that. It may be disappointing, that the trash is there every day again. You can find many things, what to do there, if you want, and the hostel and food were incredible. It was the best volunteering experience I've had. Thank you guys!! Wish you all the best! Ecodunas was one of my best volunteer experiences Ive had so far- the oasis itself is just stunning but the peolpe make it even more beautiful. 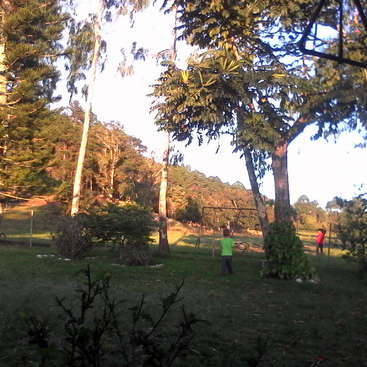 Also the work is great and fulfilling because you see the actual difference- we planted some trees and picked up the trash everyday. 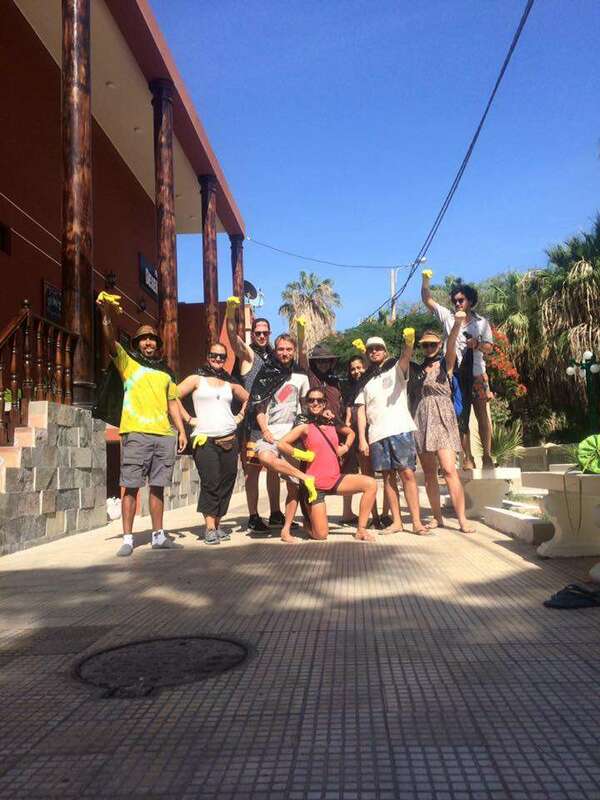 The food is amazing- so is the whole hostel with a very friendly and… read more helpful staff so dont miss this chance, go to Huacachina and do something good for our planet! Creo que este ha sido mi voluntariado favorito en todo mi viaje. Los chicos son lo mejor, muy atentos, muy comprometidos con lo que hacen, le ponen mucho amor y apoyan mucho a los voluntarios. Son personas muy flexibles y abiertas a las nuevas propuestas. También es una labor muy bonita y necesaria. He recomendado este voluntariado a muchas… read more personas y sin duda lo seguiría recomendando! Muchas gracias especialmente a Lobo! Un abrazo. I have been to huacachina first time in march, staying there as a volunteer for two and a half months. The work, as described, is not that hard, and you have a lot of freetime in between workhours. I used the time to… read more learn spanish everyday mainly. This and talking to the staff really helped me to improve my castellano. You could see it as a possibility to try out your language in a safe environment. If you have ideas for the NGO, don't be shy to communicate them, they will be heared and implemented. Thank you very much, i am grateful that i was able to stay that long to wait for my card. All the best and greetings to everyone. Our experience was simply amazing! The hostel we stayed at was confortable, hot shower, great food y muy buena onda! The work was not hard, super flexible and the best part of it is to see the before and after - it really makes you feel like you're making a difference! 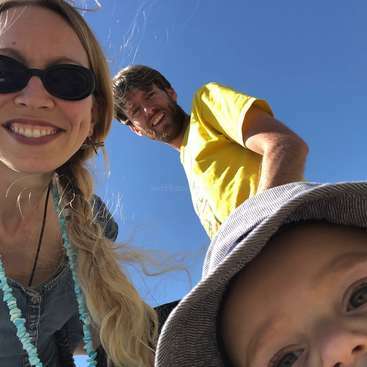 But the highlight of our experience were the incredible people we met there!… read more Cristina and Lobo are super nice and they really opened their heart to us and treated us like family! We will definitely return to Huacachina someday! :) Gracias por todo amigos! Thais and Gustavo were excellent volunteers! They had good vibes, were super nice, very sociable, and made some mean homemade hamburgers! Always there to help, even doing more than we asked of them, we were lucky to have them stay with us. Thank you!! Having spend time of my life trying to make the huacachina oasis better for everyone, was quite and amazing experience, thanks for letting me be a part of your project, I spend such a good time with Lobo and the whole crew, cleaning up the dunes and the surrounding areas, 1.5h in the morning and 1.5 in the afternoon, the daily sunsets are… read more stunning, the staff in the hostel is kind. 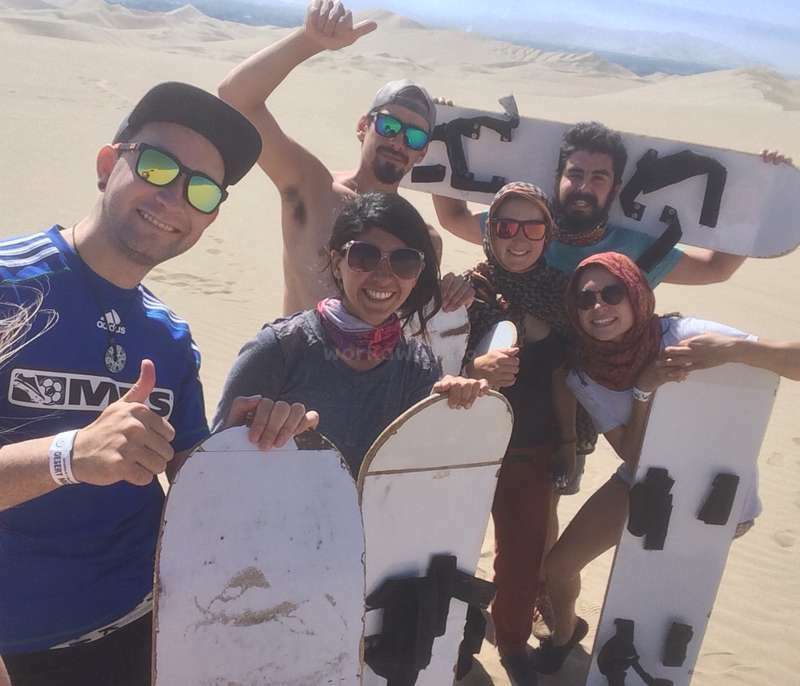 Thanks Cristine, Lobo, the rest of the volunteers and the staff for making my staying at huacachina one of the best experiences I had in Peru. My days in Huacachina were great! The job is nice, just pick up the trash in the mornings and in the afternoons, and really meaningful because you'll be actually making a difference in the environment. The accommodation and the food is very good and with the rest of your days you can just relax at the hostel's pool or go to the dunes. 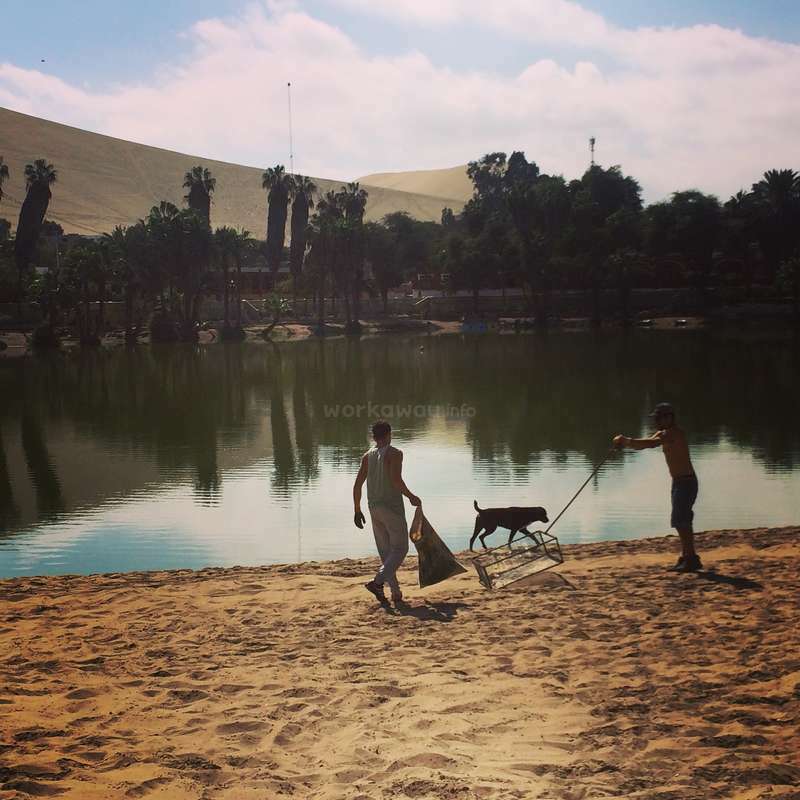 We stayed in Huacachina for 10 days and we enjoyed it a lot. After the two hours shift of picking up trash in the morning, we went to the restaurant of the hostel, where a great breakfast was waiting for us. In our free time until five pm (when the second shift of cleaning starts) we used to go to the pool, went to Ica or relaxed at the rooftop… read more and enjoyed our lunch. The hostel is really nice and clean with a super friendly staff.All in all we can really recommend this project! Staying one week here and volunteering has been a great experience. This project really allows you to see the oasis from a different perspective. It's fulfilling to do something so productive in a beautiful place and afterwards being rewarded with amazing meals in the restaurant (vegan options are included ;) ). 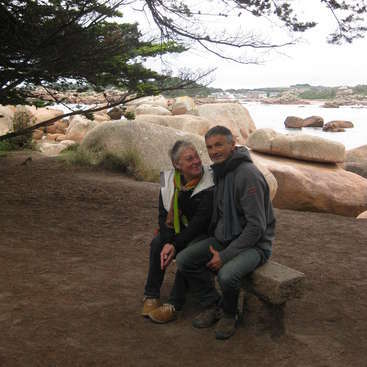 I had great people around me and… read more can fully recommend this workaway to everyone! Best wishes for te future. This work away was really nice! We have worked 1h30 on the morning and 1h30 in the end of day. It is really nice to help on cleaning desert: landscape is beautiful and the work sometimes difficult but pleasant. Between we had free time to relax. 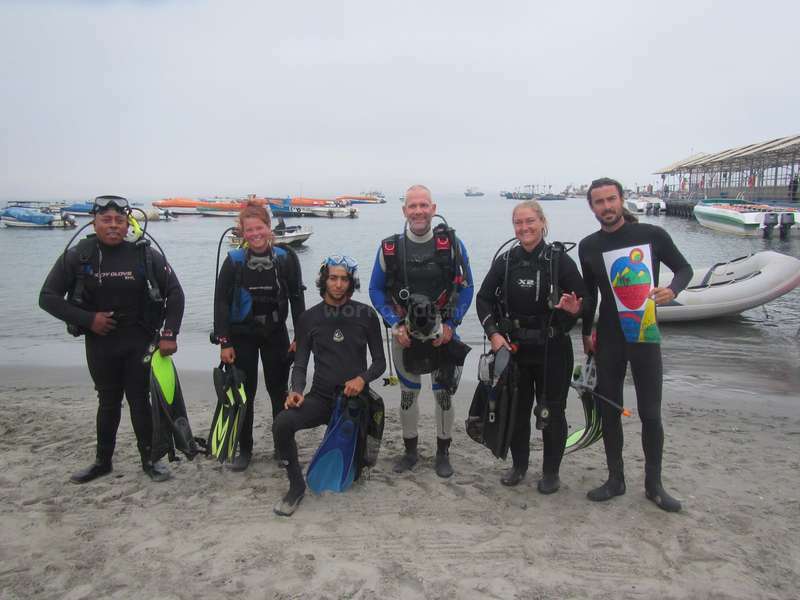 Augusto, the coordinator is really nice, available and helpful if you have any need and we had a really… read more great team. Hotel is comfortable and food good. Lina and I spent one week in Huacachina and helped to clean the Desert and the streets. The Hostel were we stayed was very confortable and the food was so delicious. Besites of the cleaning in the morning and in the evening we had a lot of free time to do sanboarding, to relax at the Pool our walk aroud the Lagune. 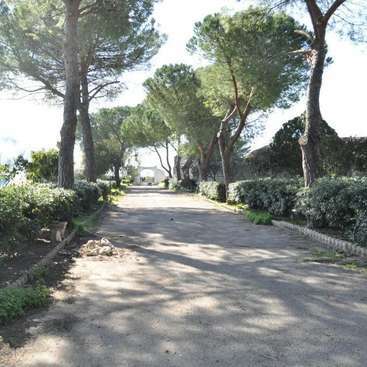 This place is perfect to do… read more something realy useful and to relax at the same time. We had such a great time here and med a lot of nice people, thank you guys we hope that we can come back on day. Nico is a wonderful volunteer full of energy, good vibes, and an incredibly hard worker. We miss you already! In Lobo's words..."He is AMAZING" :) Thanks for helping out with our project! Outstanding... I really enjoyed being in Huacachina, roaming the dunes and streets with a bag in one hand and an extensive supply of filth in reach of the other. If you can't handle picking old diapers and toilet paper out of the scorching desert sands, you might find this project challenging. If however, you can handle hot dirty work in the… read more service of a beautiful natural environment, then this will be very rewarding. We picked up trash for a couple of hours morning and evening, when the day is cool enough to make things possible. It's really great seeing things getting better before your very eyes. It's also somewhat heartbreaking seeing things get worse again, so it's important to be realistic about just how long it takes to change entrenched habits. The crew at Desert Nights are absolute champions, the accommodation comfy and the food delicious. There is a deluxe kitchen with the facilities to cook anything if you feel so inclined, and the surrounding desert is breathtakingly beautiful. I felt absolutely at home, feel free to ask me any questions you like. Katherine was a hard working volunteer who was always on time and respectful. She was a joy to have helping us recruit as she was very personable and good at relating to others. Highly recommended as a volunteer! We were lucky to have her! This was hands down the best workaday I've ever done. 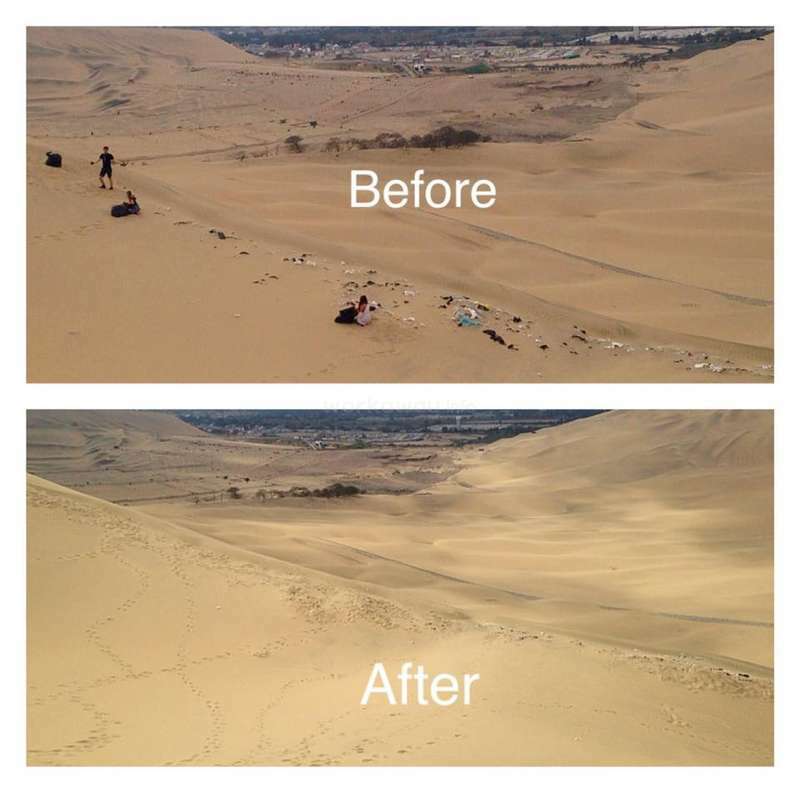 I had a ton of fun hiking the dunes and organizing clean-ups. The accommodations are great. Clean, friendly & fun staff, and great food. I can't recommend this experience enough! It's great exercise, loads of fun, and you're doing something that truly matters!! 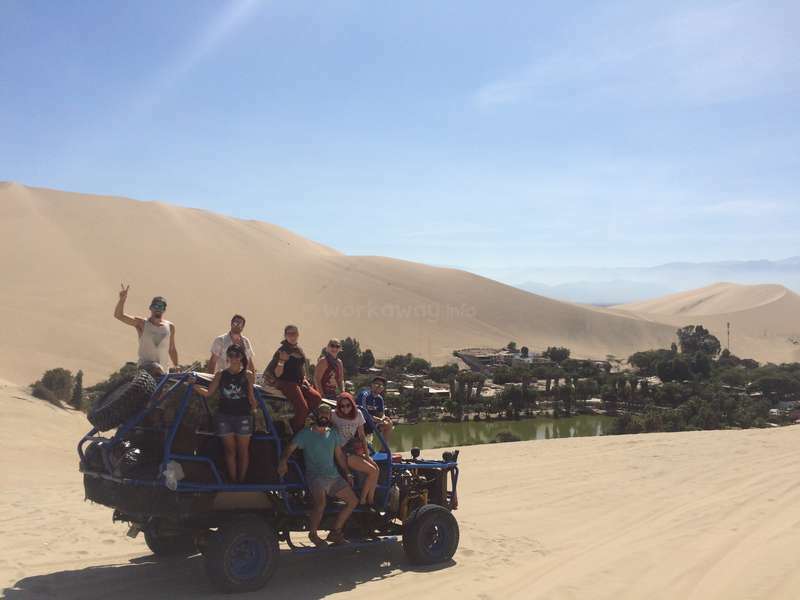 Feel free to contact me with any… read more questions because I LOVED my time in Huacachina!